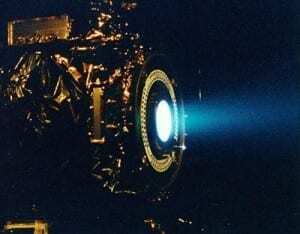 Electric rocket engines known as Hall thrusters, which use a super high-velocity stream of ions to propel a spacecraft in space, have been used successfully onboard many missions for half a century. Erosion of the discharge channels walls, however, has limited their application to the inner solar system. A research team at Caltech’s Jet Propulsion Laboratory, in Pasadena, Calif., has found a way to effectively control this erosion by shaping the engine’s magnetic field in a way that shields the walls from ion bombardment. Ions are produced in Hall thrusters when electrons from an electric current collide with the propellant atoms to form a plasma in the discharge chamber. Thrust is then generated by the interaction of this current with an applied magnetic field that creates a strong electric field. The magnetic field is mostly perpendicular to the channel walls whereas the electric field is mostly parallel to the walls. This electric field then acts as the driving force on the ions, accelerating them to very high speeds (>45,000 mph) toward the exhaust opening. However, the presence of a plasma in the thruster’s discharge chamber leads also to a small component of the electric field parallel to the magnetic field lines. This component then accelerates some ions toward the discharge chamber (rather than the exhaust opening) causing erosion by sputtering material from the walls. Guided by theory and numerical simulations, the research team designed a thruster configuration in which the effect of the plasma on the magnetic field lines along the walls is minimized, forcing the electric field to be perpendicular to the lines. Based on the numerical predictions, the effect of this magnetic field topology would be to accelerate ions away from walls while also significantly reducing their energy adjacent to the walls. Erosion then would be reduced without degrading propulsive performance.